Enhance your lawn or landscaping using the Arboria Claremont Cedar Landscape Screens. Placing these panels in your yard brings a dramatic look to it, with their cedar body and intricate grid pattern. Three thick horizontal slats, followed by three thinner ones, create a detailed pattern, while the intersecting thick and thin vertical rails help create a screened look. A slight arch at the top of each trellis contrasts this square, triple-plaid interior, completing the unit. The screens install easily into soil, and can be placed singly to support individual climbing plants. For a different look, place all three of these units in a row to divide your lawn or create privacy. Their 59" height is also fantastic for camouflaging an air conditioning unit, and their legs allow you to sink them slightly in soil if desired. Made from durable, western red cedar, the screens will withstand use outdoors thanks to their natural rot and decay resistance. Divide your backyard or hide a pool pump elegantly using the Claremont Cedar Landscape Screens. Made in the USA. 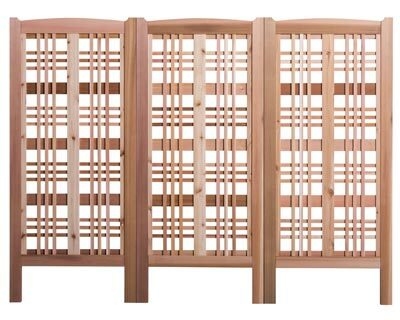 Note: This description refers to 3 of the Arboria Claremont Cedar Landscape Screens, Tan, 59"H.